When you travel as frequently as we do, travel surprises are a given. Of course, when you're on vacation, surprises can be good or bad. We seemed to encounter an unexpected number of surprises (both good and bad) on our long weekend trip to Madeira. 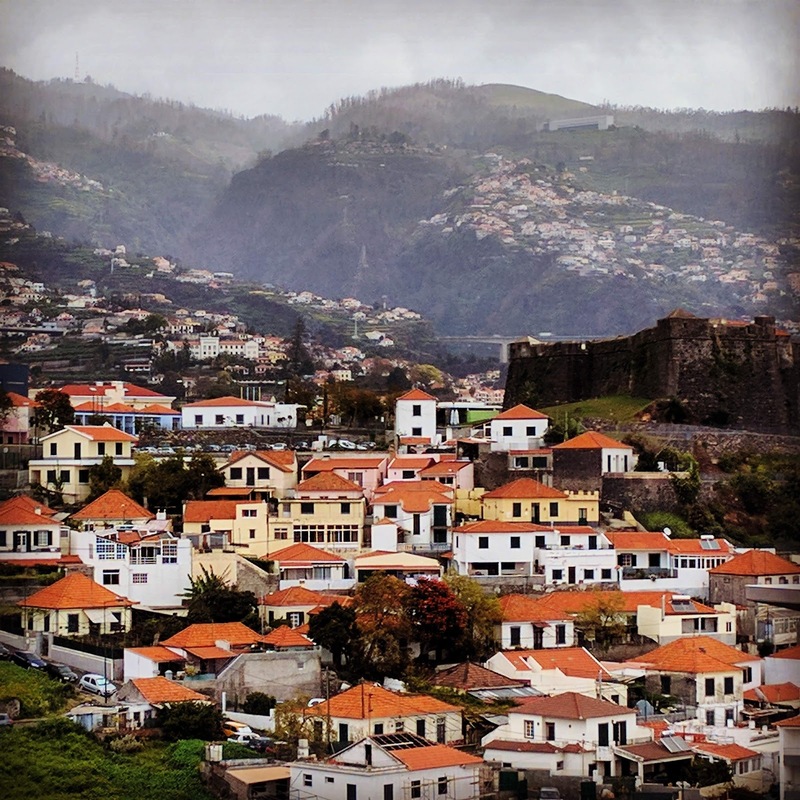 Read on to find out more about the ups and downs of our travels in and around Funchal. Our arrival in Madeira was definitely a portent of things to come. It was windy and a bit bumpy on our approach to Funchal airport. We were making our final approach and had nearly touched down when all of a sudden we shot up again: an aborted landing! We circled for a while and then the captain finally came on to let us know what had happened. Apparently, there are very strict landing conditions in Madeira and the winds can't be too strong. They were teetering right around the limit and gusted above the threshold on our approach so we had no choice but to pull up again. After circling around for about 10 more minutes, we approached Madeira Airport again and nailed the landing this time. I love it when people clap upon landing in some European countries. In this case, I led the clapping and we got the plane going in a rousing round of applause! The surprises continued when we went to catch the public bus to Funchal and found a long snaking queue. The bus rocked up and was tiny. We didn't make it onto the bus and they were not sending back-up. The next bus was due two hours later. We ended up sharing a taxi with a Madeiran-born guy who lives in London. He said that they normally send a much bigger bus. He isn't sure what happened in this case. At least we made it to the city more quickly than we would have on the bus and got dropped off right at our hotel door. Suite Upgrade at the Four Views Baia! For our next surprise, things took a positive turn. We checked into the Four Views Baia Hotel and were given a key for a room on the top floor. We unlocked the door, went it, and realized we'd been upgraded to a penthouse suite complete with jacuzzi tub and a huge balcony with a view of the surrounding mountains. Things were starting to look up! Unfortunately, it rained on our first day in Funchal. We quickly discovered that the fantastic mosaic stone streets arranged in all sorts of awesome patterns get incredibly slippery when wet. Fortunately, we didn't fall down and hurt ourselves but we essentially had to slow our walk to a crawl on the wet sidewalks. Not a fun surprise but I suppose it could have turned out much worse. We encountered another positive surprise when we learned how extensive the public bus network is in and around Funchal. Madeira is extremely hilly and the buses go up the steep slopes and wind around extremely narrow curving streets. The impressive bus drivers seem to do this at breakneck speed with relative ease. The public bus is a great option for getting up to Monte or back to Funchal after taking a toboggan ride. 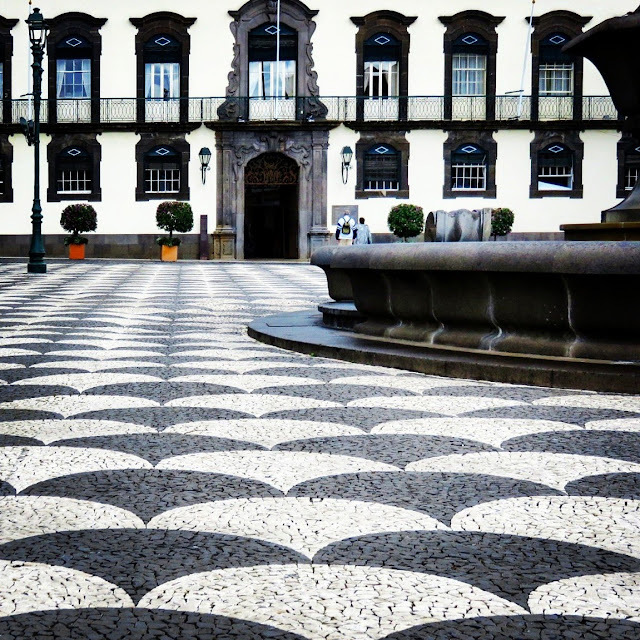 Madeira is famous for levada walks; hikes along the picturesque irrigation channels that criss-cross the island. We were supposed to do a short levada walk as part of our Hit the Road day tour. Instead, we encountered heavy fog making the walk impractical and had to skip it. Surprise! Later in the day, along the coast, we had stopped to look at a scenic viewpoint when we noticed a path snaking along the water. We asked our guide where it went and how long it would take to walk it. He told us the path was about a 15 minute walk along the water and that he could pick us up on the other side. We walked along the water, drinking in the views and dodging the waves crashing up against the rocks and the splashes that regularly made it up onto the path. 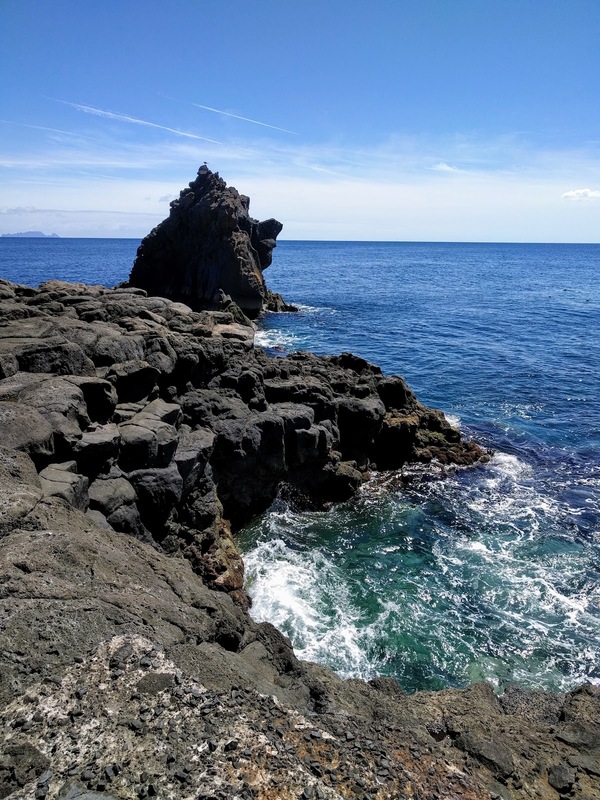 Honestly, this unexpected surprise turned out to be one of our favorite parts of this day trip around the eastern side of Madeira. We bought a book prior to our trip, Madeira Walks: Leisure Trails Volume 1 and were excited about exploring Madeira on foot. We set out on a walk from Monte, book in hand, to descend from the hills back to Funchal. We were definitely in for some surprises. There was a huge wildfire on Madeira in the summer of 2016 and we saw charred trees all along the path. We also noticed that the landmarks referenced in the book seemed to be missing. For example, we were instructed to follow the quaint log staircase with wooden railing. Yeah...I think that's gone now. The trail was supposed to take 2-3 hours to complete. After about 45 minutes the trail was really hard to follow and it seemed dangerous to continue for fear of getting lost or injured. I hate turning back though. We ran into another couple on the trail who indicated that there was a small town just up the hill about a 10-15 minute walk. We expected that we could catch a bus from there to get to Funchal with the added bonus of seeing something new rather than backtracking. We set out up the trail they had come down. It was very steep with some crazy switchbacks. At one point we came to a cross-roads and both directions seemed to lead nowhere. We took a chance and climbed up further only to turn back again when the trail petered out. We hugged the path along a steep cliff until we came to a fallen tree blocking the path. We managed to climb through the tree and out the other side and did indeed find the trail head. We were super-excited that we'd made it out!...That is, until we saw a pack a wild dogs lounging in the street near the trail head. We'd have to go right past them to get to town. Sigh. We weren't comfortable walking past the dogs when we were potentially far from help if we were chased or bitten. We quietly turned around and retraced our steps back to Monte. On the bright side, this gave us the opportunity to take a toboggan ride from Monte to Funchal which turned out to be one of the most memorable experiences on our long weekend trip to Madeira. We had a little time to kill before our dinner reservation one night and wandered down close to the cruise port in Funchal. We discovered a strange stone structure and an open door. It turns out this was Forte de Sao Jose which for centuries was considered an independent nation; the smallest in the world. Today Forte de Sao Jose seems to be a sanctuary for stray cats. It also offers fantastic coastal views from Funchal out to sea. What a fun surprise and diversion. I like to think of poncha as a Madeiran margarita. 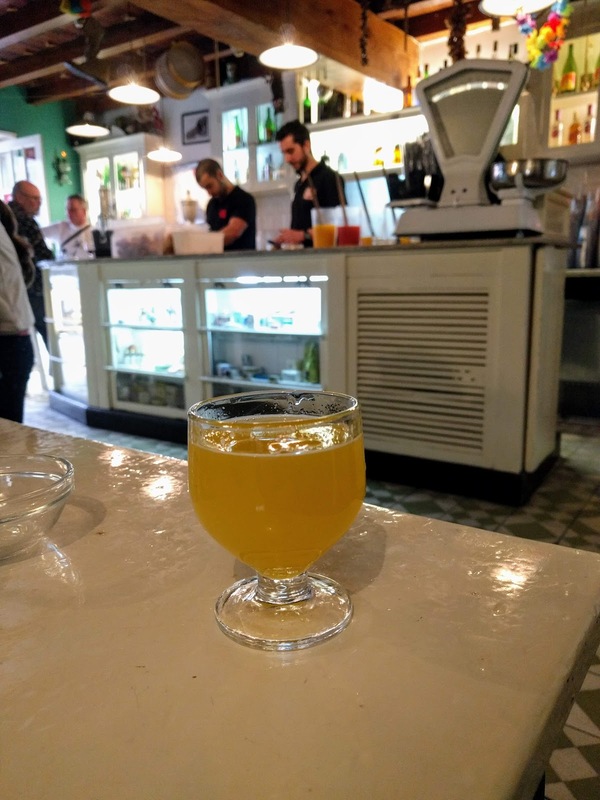 Made with a rum-like liquor combined with sugar, honey, and citrus, poncha is strong and tart. Poncha is often served with a bowl of bar snacks. We were sitting in a quiet bar in the old town having a poncha when we were surprised to find a pair of pigeons walking in liked they owned the place. The lads were looking for handouts and realized that bar snacks and crumbs tend to fall from tables onto the floor. 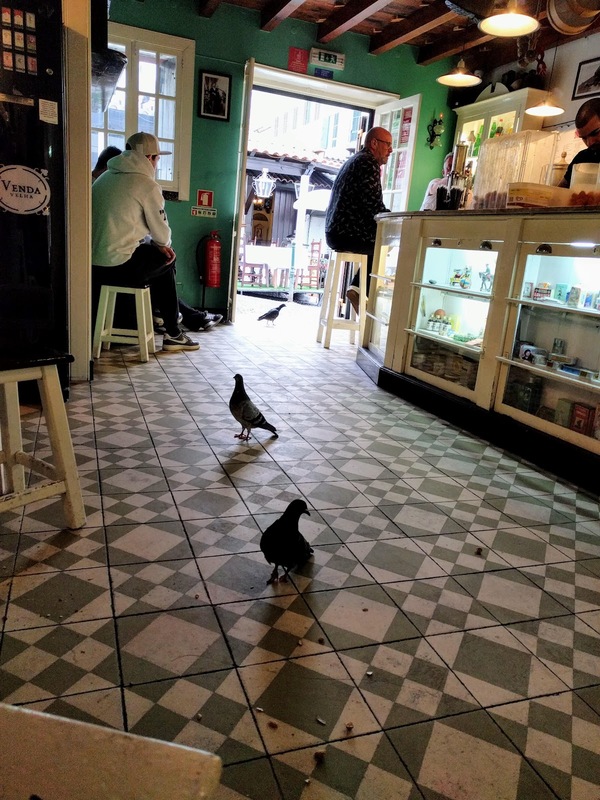 These Madeiran pigeons weren't fazed at all by the folks at the bar. Hilarious! We encountered the best surprise of all on our return to the airport in Madeira. We managed to take the public bus this time which got us to the airport over 2 hours before our flight was scheduled to depart. We noticed that the airport was connected by a bridge and an elevator to a parking lot that seemed to be just a short walk from the sea. Of course, we got the best weather just as we were about to leave. We thought, why not?! Let's take a walk along the water before we go. We walked for about 10 minutes and noticed a staircase leading down to the sea. 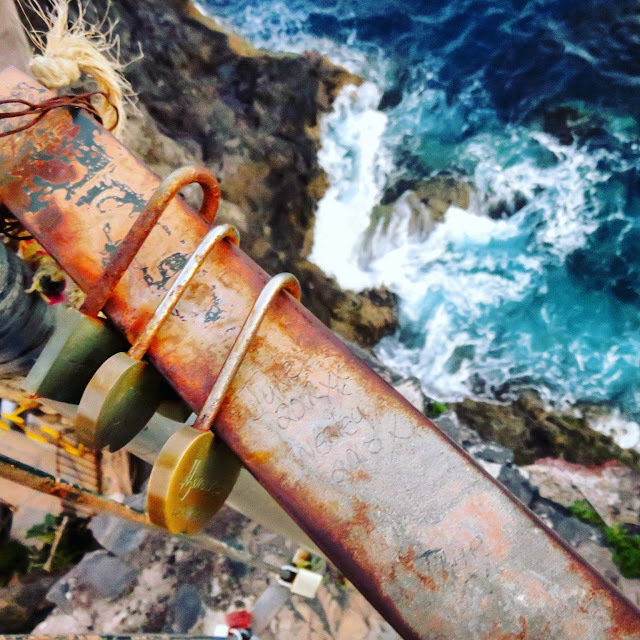 We spotted fisherman at work and gorgeous black rock formations contrasting against the colors of the deep blue sea. We were surprised to find one of the most picturesque spots that we encountered on our entire long weekend within walking distance of the airport! There is also a small traditional cemetery nearby that was another great surprise and definitely worth a look. As you can see, our weekend trip to Madeira was full of surprises both good and bad. The trick is to just roll with it. What are the best and worst vacation surprises that you've encountered? Leave a comment below and let us know! 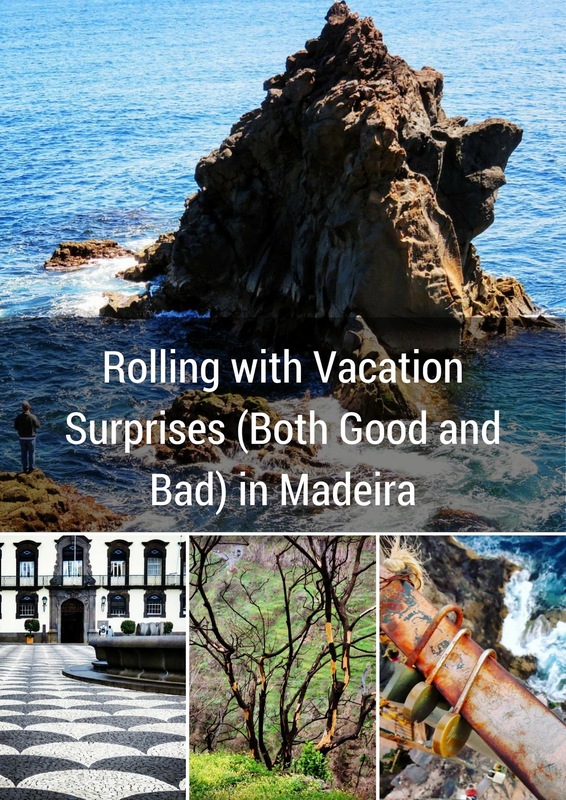 Learn about vacation surprises encountered in Madeira and how to embrace the unexpected on a long weekend trip. A photo-rich post by travel blogger, Jennifer (aka Dr. J) from Sidewalk Safari.